You’re gonna truckin love it. This is where the magic happens. 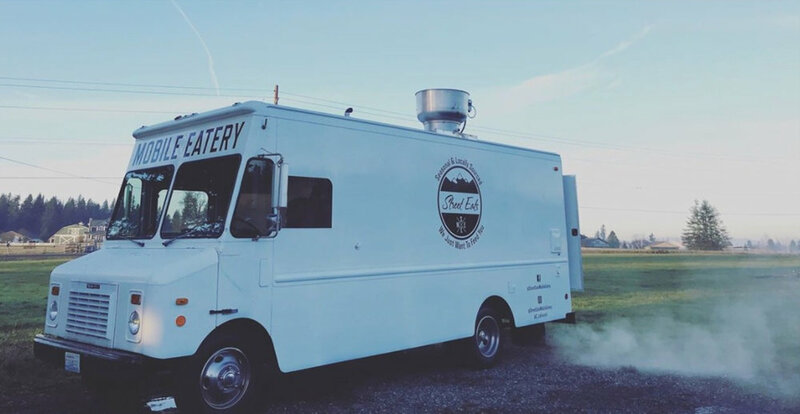 We craft high quality, fresh, and seasonal cuisine in our mobile eatery. Our food is always handcrafted and made to order for restaurant style and quality. You can typically find us hanging around the south end - Bonney Lake, Sumner, Tacoma. Keep an eye on our calendar to find out where we will be and when. Dillanos Coffee Roasters - Every Thursday! Come join us every Thusday 11:00 am - 2:00 pm for fresh locally sourced and seasonal street eats and a great cup of Dillanos coffee. Come check us out at Blue Max - a world famous butcher shop! Need us to serve at your next event? Book us today! You asked. We answered. Here we are in our own backyard - where Street Eats was born! Burger and a Beer? Come down and join us for dinner! Such a good atmosphere that James has created. Has an amazing outdoor space with awesome tents, heaters, fire place and always has a the games playing! Whats better that beers and good eats? Beers, good eats, and games! Join us every Saturday at this local spot. Edison City Alehouse - Recurring event! Join us at this neighborhood taproom and bottle shop in the heart of the historic Edison district of South Tacoma for great brews and eats! Street Eats and a brew, every Thursday, or as we like to call it - Friday Jr. Come join us!